Charlie Parker's three studio sessions with strings came at a time of great ongoing improvements in recording quality, with the innovations of both tape recording and the commercial vinyl record both being contemporary developments. Hence the first six tracks here were cut directly to disc, in the traditional manner, and with the traditional problems for a restorater to contend with! By contrast I'm pretty certain that both the 1950 and 1952 sessions were taped. This was a time where recordings were being issued on both the 78rpm shellac and new 33/45rpm vinyl microgroove formats. Each of these performances is timed to fit a single 78rpm side, though the first ten-inch LP, consisting of tracks 1-14, was released in the USA as early as 1950. The four tracks which complete this release found their initial vinyl issue on a 7" 45rpm EP. So why go back and remaster these recordings, when there's a perfectly well-loved Verve CD on the market? Well personally I've never been 100% happy with the sound - and I've always felt that it's one of those recordings which is tantalisingly close to sounding so much better. Therefore I was fascinated to find out how it would respond to my continuing experimentation in widening the application of XR remastering beyond the realm of classical music. The effect of the remastering for the listener is to remove what is at times quite a heavy veil over the music, as well as greatly improving on what was at times a pretty poor tonal balance. What the remastering revealed to me, especially with the earlier cuts, was in some instances some really quite flawed originals, which then required a considerable degree of pretty advanced further restoration. Some of damage this is still just about audible in Summertime - you may just notice a slight 'waa-waa' effect in the upper treble at times, a problem previously buried under the murk and one that's particularly time-consuming and tricky to correct. Elsewhere, on I Didn't Know What Time It Was, a small amount of occasional disc-surface noise may be apparent if you're listening closely for it. Those earliest tracks were also the most unruly with regard to the overall sound balance, with the strings tending to get quite shrieky if given too much free rein in the upper treble registers. I think I've managed to contain them effectively, and it's been a real delight to hear these recordings as if for the first time. I hope you'll enjoy listening to them as much as I've enjoyed working on them! Tracks 1-6: November 30, 1949; Reeves Sound Studios, New York City. Tracks 7-14: July 5, 1950; Reeves Sound Studios, New York City. Tracks 15-18: January 22, 1952; First Ave. & East 44th St., New York City. 1949 - Charlie Parker With Strings: Parker (as), Stan Freeman (p), Ray Brown (b), Buddy Rich (d), Mitch Miller (oboe), Meyer Rosen (harp), Jimmy Carroll (arr-cond), strings. 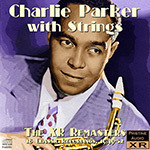 1950 - Charlie Parker With Strings: Parker (as), Joe Singer (French horn), Edwin Brown (oboe), Verley Mills (harp), Ray Brown (b), Buddy Rich (d), Bernie Leighton (p), Joe Lippman (arr-cond), strings. Lou Stein (p), Art Ryerson (g), Bob Haggart (b), Don Lamond (d), Joe Lippmann (arr, cond), strings, woodwinds. Charlie Parker was growing increasingly dissatisfied with small-combo jazz and the usual venues for it (nightclubs) by the late 1940s. As Gary Giddins put it in his liner notes for the old Columbia album, Bird with Strings (34832), “His healthy passion for European classical music had been distorted into feelings of inadequacy, and he came to believe in the respectability of strings . . . He hoped to commission a work by Stefan Wolpe and implored Edgar Varese to take him as a student.” Charles Mingus also remembered a phone call from Bird’s apartment, late at night, in which he improvised lines over a recording of Stravinsky’s Firebird. Yet oddly, he never moved into these more adventurous realms, nor did he commission his friend Mingus to write him something. Mingus had already shown himself a master of what he would later call “jazzical moods,” but his expertise was limited to wind instruments (flute, piccolo, clarinet, oboe, which he often used as “substitute” violins and violas), and such lower string instruments as the cello and bass. Nevertheless, there is a certain sadness in the fact that Parker chose instead to commission fairly mundane charts of the type that had been played for years by Tommy Dorsey, David Rose, Mantovani, and Spike Jones (his “Other Orchestra”). Indeed, except for the last of the three sessions presented here, neither the arrangements nor the jazz content were at all worthy of Parker’s genius. He was swimming in the murky waters of what became known as “middle-of-the-road” music; but swim he did, with wit and sparkle and a joie de vivre often lacking in his more serious jazz recordings. The first “Bird with Strings” session occurred in 1948, but none of the sides were ever issued; even the titles remain unknown. A year later, in November 1949, producer Norman Granz had corralled the highly gifted if schlock-minded oboist Mitch Miller as contractor for the recording date. Miller quickly lined up a crew of outstanding freelance musicians, including two members of Arturo Toscanini’s NBC Symphony Orchestra (violist Frank Brieff and the legendary cellist Frank Miller). Though the arrangements were rather ordinary, Parker’s playing was simply extraordinary. He seldom sounded so happy on records, and called “Just Friends” his favorite performance on record. Nearly a year later he was back in the studio to record eight even less-inspired arrangements by Joe Lippmann. Despite spot solos by pianist Bernie Leighton, the musical interest in these sides had clearly deteriorated. Bird was so unhappy that, when he appeared at the Apollo Theater in Harlem with his string section(! ), he paid for an entirely new arrangement of “Easy to Love” by the gifted Jimmy Mundy who, among other felicities, crafted an 8/4 release played pizzicato by the strings. This was the performance issued on the Columbia LP. This CD uses the studio version arranged by Lippmann. For his last string session, Parker apparently came to realize that the discs were hurting his reputation. Thus these last four Lippmann arrangements are much more rhythmic and excitingly arranged, combining the strings with a full big band. Spot solos by such gifted musicians as trumpeters Chris Griffin (Benny Goodman’s old section leader), Bernie Privin (alumnus of the Artie Shaw orchestra and Glenn Miller’s Army Air Force Band), and Al Porcino, trombonists Will Bradley and Bill Harris, and pianist Lou Stein (also an alumnus of the Miller AAF band) give far more interest to the proceedings. Especially fine is the upbeat version of Rodgers and Hart’s Lover, long a jazz musician favorite because of its descending chromatic melody. Although Andrew Rose’s transfers are absolutely stunning—I compared them not only to an old Verve LP that I had, but also 1991 and 1994 transfers done by Verve itself onto CD—I have to admit that for me personally, I missed some of those exciting live performances that Bird gave with strings at the Apollo, Birdland, and Carnegie Hall, particularly the Mundy arrangement of Easy to Love, a stunning rendition of What Is This Thing Called Love?, and Neal Hefti’s Repitition, which Parker recorded commercially without strings. Despite the hue and cry of jazz buffs nationwide, the Bird-with-Strings discs sold extremely well, leading other jazz musicians to enter even murkier musical waters. The problem with the arrangements is not that the strings do too much but too little. Duke Ellington and Billy Strayhorn would craft two superb pieces with strings, Harlem and Night Creature, and in 1961 alto saxophonist Stan Getz won a Grammy for the album he made with string arrangements by the gifted Eddie Sauter, “Focus.” And it’s not as if there weren’t any other arrangers available to Bird at the time. Artie Shaw had recorded some outstanding jazz-with-strings arrangements by Paul Jordan, Bill Challis, William Grant Still, Ray Conniff, and Margie Gibson; even as far back as the 1920s, both Roger Wolfe Kahn and Tiny Parham had found a way of integrating strings into a jazz ensemble so that they played interesting figures. All Bird had to do was listen to the way Joe Venuti, Stuff Smith, or Stephane Grapelli played the violin in jazz to get an idea of the instrument’s incredible range and flexibility. But such is life. A footnote. Varese agreed to work with Bird in early 1955 and told him to get in touch after the Easter holiday, but Parker died on March 12 of that year—a tragic loss to music, whatever one thinks of the “Bird with Strings” experiment. This article originally appeared in Issue 32:1 (Sept/Oct 2008) of Fanfare Magazine.